Sa Calobra is situated in a quite isolated place on the northwest coast of Mallorca. Officially Sa Calobra has one beach but you will find two beaches. 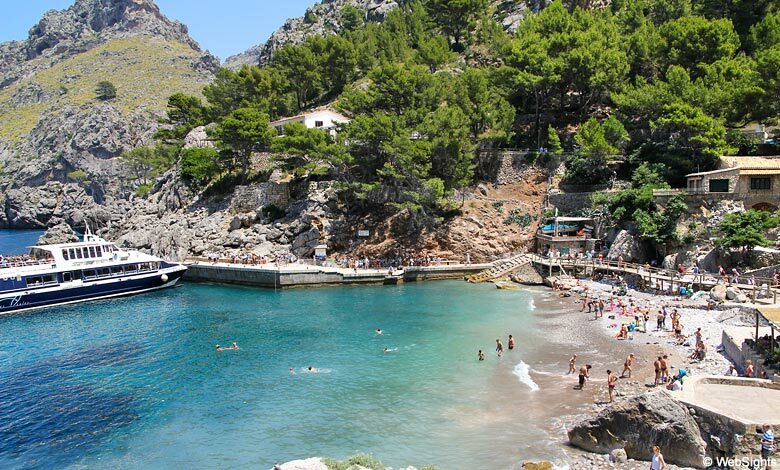 The unofficial beach is right in front of the small village in the bay La Calobra. The official beach is situated between the cliffs where the canyon Torrent de Pareis reaches the sea. It’s only a short walk from Sa Calobra, partly through spectacular rock tunnels. There are no services at this beach. Both beaches are small, however situated in absolutely stunning surroundings. The beaches have a mix of sand, gravel and small stones. The water is very clear and has different shades of turquoise, in particular the beach by Torrent de Pareis. The beaches are definitely worth a visit if you want a special beach experience and are prepared for a little less comfort than usual. The beaches are less child friendly. The water is not particularly shallow and there are too much stones for small children. There are some cafés and restaurants by the beach in front of Sa Calobra. Sa Calobra is a nice but very small village. During the high season it’s visited by dozens of tour busses due to the 5 km long canyon Torrent de Pareis, one of the most popular attractions in Mallorca. 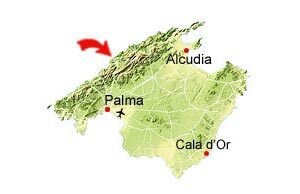 It is possible to reach Sa Calobra either by car or by boat sailing from Port de Sóller. Both aoptions are beautiful nature experiences and so is Torrent de Pareis. The two beaches are easy to spot on the satellite photo. The unofficial beach in front of Sa Calobra is on the left side while the official beach is on the right side by the outlet of Torrent de Pareis. Port de Sóller is to the south-west.